Loving Miss Marsha’s CAS heart challenge this week. I hope you’ve noticed that we’ve changed our accepted definition of Clean and Simple for our Wednesday Challenges. Going forward you’ll have a little more freedom to add to the previous basic paper and ink only. Check the image above for the definition we are now using and I hope to see your creation in the linky this week. The simplicity angle of this weeks Clean and Simple (CAS) led me to yet another Redwork style creation. You can see my first one for this year here. In this case I took a bit of liberty with a more silhouette style image instead of a full line image. Either way…I feel it works. Here’s the explanation about Redwork that I shared in the earlier post. When I was a munchkin my mom taught me about redwork stitching. The type of embroidery where you use only red thread (in this case I selected Cherry Cobbler as my “red”) and generally the patterns are a bit retro and mostly outlines since redwork was something popular many, many moons ago. Here’s a link to a basic description and a free pattern if you want to give it a try in the none ink world. Tools & Adhesives: Big Shot, Hearts Collection Framelits (retired), 1/8″ Gold Ribbon, Dimensionals and Bone Folder and Clear Acrylic block or two. Cardbase: 5-1/2″ x 8-1/2″ Whisper White. Score at 4-1/4″, fold and crease with bone folder. Die cut Focal Layer: 4″ x 5-1/4″ Whisper White Cardstock – I’d suggest you use the Thick Whisper White so the dimensionals don’t show through. 1) To form the heart cut window…die cut the focal layer piece with next to largest smooth heart framelit die from the now retired Hearts Collection. If you don’t have that set one of the current heart dies should also work or you can substitute an oval, circle, square or other shaped die to cut the window. 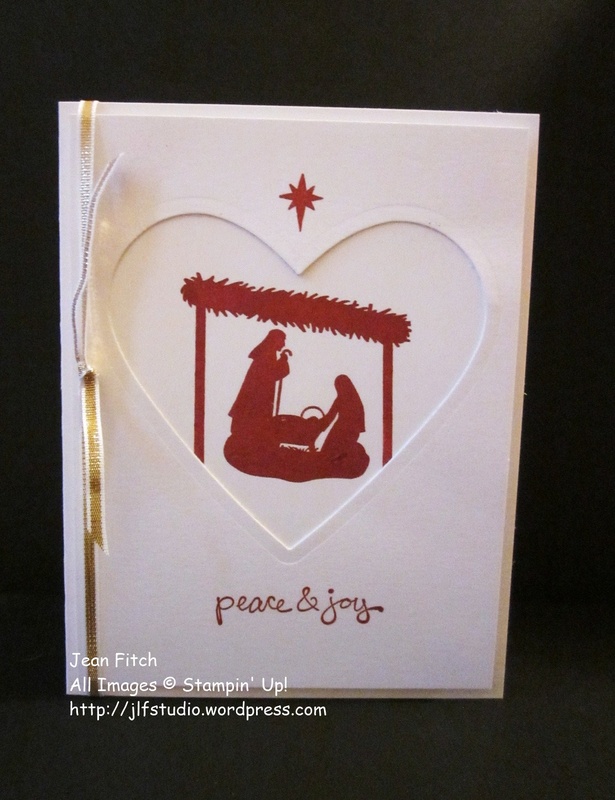 2) Stamp the small evening star image from the Joyful Nativity set above the center portion of the heart die cut window. Stamp your sentiment (I chose the peace & joy sentiment from the retired Good Greetings stamp set) centered below the heart shaped window. 3) Stamp your manger and family images from Joyful Nativity in the center of the underlayer piece. Don’t forget to use a piercing pad or other soft mat under your stamping surface so the “bold” images transfer the most ink. Trim the underlayerlayer piece if needed so that when you adhere to the die cut heart layer you don’t have any edges peeking out. Using SNAIL, Fast Fuse or glue dots adhere the underlayer piece under the die cut so the manger scene shows to best advantage through the heart shaped window. 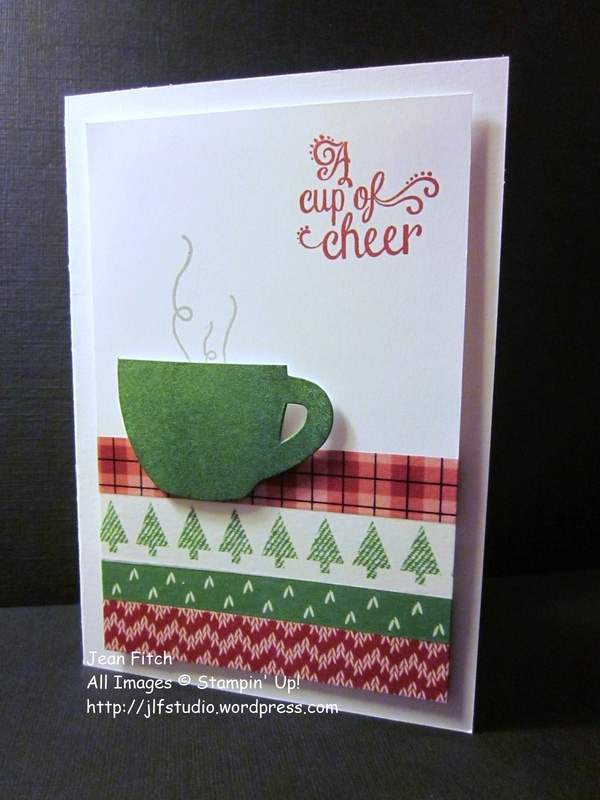 4) Attach the combined focal layer with dimensionals to the front of the card. 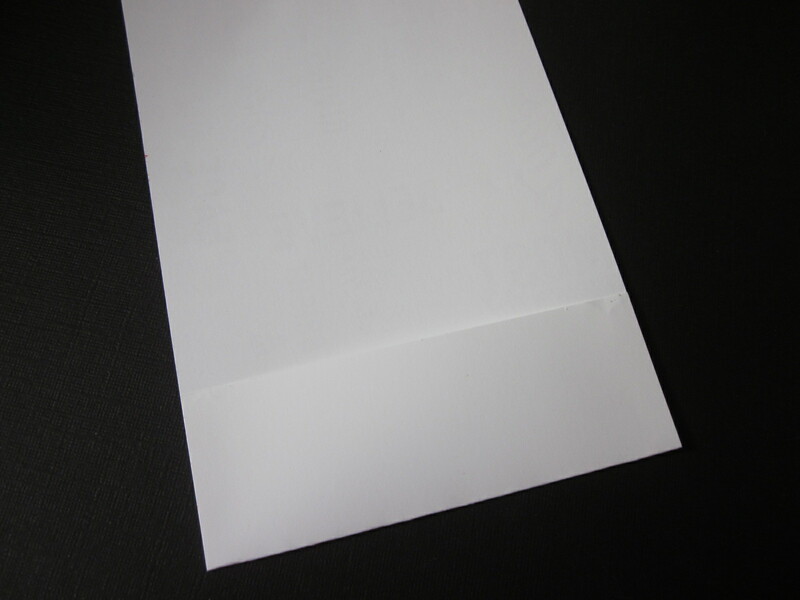 Add whatever you want to the inside of the card and decorate the envelope as well. 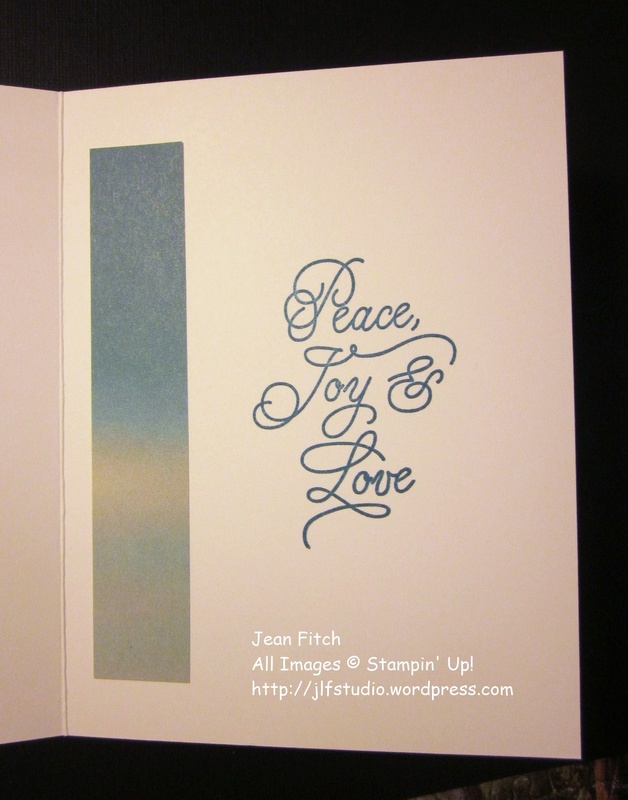 I stamped the Peace, Love & Joy sentiment from Peace This Christmas along with the small angel from Joyful Nativity. I also added a small strip of designer series paper to dress up the inside of the card. That’s it for this challenge. 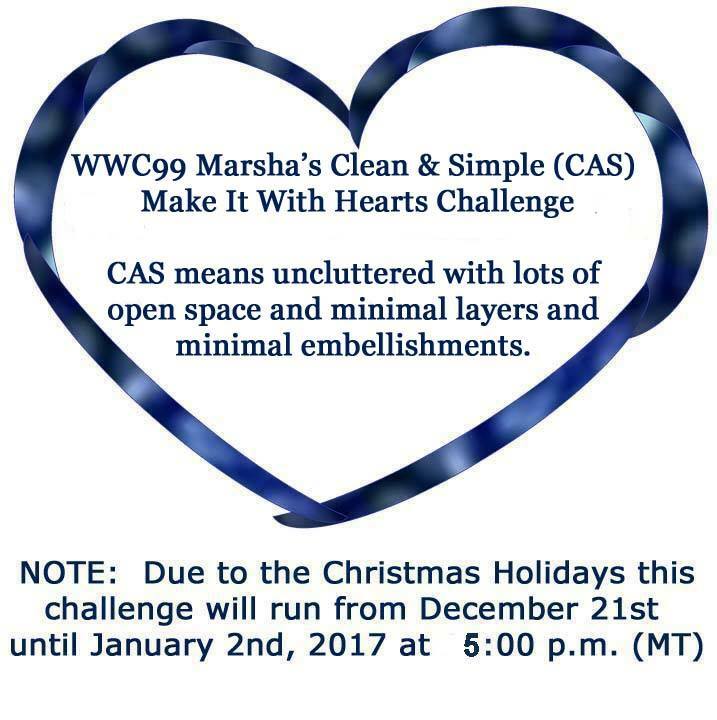 To see the rest of the design teams contributions to Marsha’s CAS Make it with Hearts Challenge head on over to the Challenge blog website here. That’s also where you can add your own creation with the linky doodad. When you add your own design and there are more than three entries, one of you will be a challenge winner or runner up and have the option to place our badges on your own site. Of course…you’ll also win bragging rights! Don’t forget that this time around you have two weeks to add your linky creation. We’re taking a break for Christmas so this week’s challenge runs through January 2nd. I’m hoping to return to lots and lots of fabulous creations added to our challenge page to inspire and delight all the readers and design team. Many Blessings and may your Christmas (or other Holiday Celebration) be filled with Peace & Joy. Many thanks Miss Penny for a sketch challenge that allowed me to continue my Warmth and Cheer Washi Tape and paper addiction! I just can’t seem to stop using those lovely products. 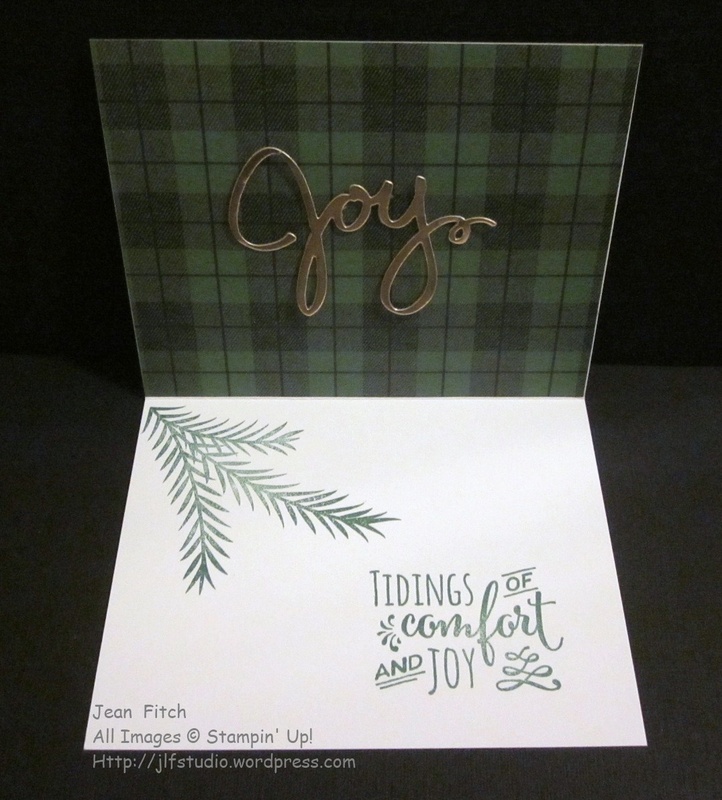 Didn’t hurt either that the Stampin’ Up End of Year Close Out Sale is featuring those and other wonderful products I used on the card too. Lots of stocking up opportunities before it’s all gone! With several inches of snow predicted this week (somewhere between 3-6 inches in my little mountain valley) I just had to use a white background and then warm it up with holiday colors. As usual I couldn’t resist flipping the sketch and adding a few different elements. After all…just because there is a layer required doesn’t mean you can’t layer that layer with lots and lots of a favorite washi tape right? And can you guess the trick I pulled so I’d have a full clean and white wreath center to play with? Oh…and did you notice my word for this year is JOY? 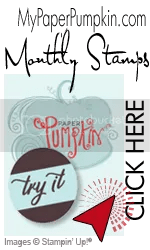 That seems to be showing up everywhere as I design my projects, though I’m having to get a tad creative for single versions since Stampin’ Up doesn’t have quite as many versions of that word that a yearlong use may require. Hint…hint…if you’re reading this SU. Otherwise known as a further sign of my addiction! I’ll let you in on a little secret. The Designer Series Paper piece is covering up lots and lots of ink! What started out as the front of the card ended up with some green smudgy thumb prints by mistake that ruined the nice Clean and Simple look I had going on. Luckily creativity and some gorgeous paper came to the rescue. I flipped the card so that I had a clean front to redo and a challenge to clean up on the interior. As it happened I love what that led too. A lovely plaid flannel look that provided the perfect background for a bit of golden joy and a nice offset for the pine bough and sentiment just below it. I was so taken with how this design turned out that it just made my line up for the additional Christmas cards I still need to send out. 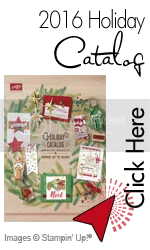 Tip: To keep the area inside the wreath clean and white for decorating or leaving plain take your inside of the wreath framelit and line it up with the inside of the wreath on top of your washi tape cardstock layer and run through the Big Shot again. Without that step you end up with a bit of a messy looking partial bit of washi tape peeking through the center of the wreath. Cardbase: Basic cardbase of Thick Whisper White Cardstock cut to 5-1/2″ x 8-1/2″ and scored at 4-1/4″ then folded and creased with a bone folder. Washi Tape Covered Layer: 2″ x 4-1/2″ Thick Whisper White – Cover with alternating rows of washi tape from the Warmth & Cheer collection that’s currently on sale (Yay! I 💘 saving money.). 2) Fit the inside ring die from the wreath back onto the wreath and place over the washi tape panel where you want the wreath to sit then run through the Big Shot. You may want to use a bit of washi tape to hole it all in place even if you use the magnetic platform so it doesn’t move on you while transferring to the cutting platform. 3) Wrap the Garden Green Baker’s Twine twice around the washi tape panel and tie a bow to one side. Using Garden Green ink stamp the sentiment from Santa’s Sleigh stamp set on the card front once you have the placement of the washi tape layer estimated. You might want to use some pencil tick marks to show the placement of the layer. 4) Adhere the washi tape panel above the stamped sentiment with Fast Fuse (or other adhesive). Attach the Wreath with dimensionals making sure to line up the die cut area on the panel with the die cut line on the wreath. 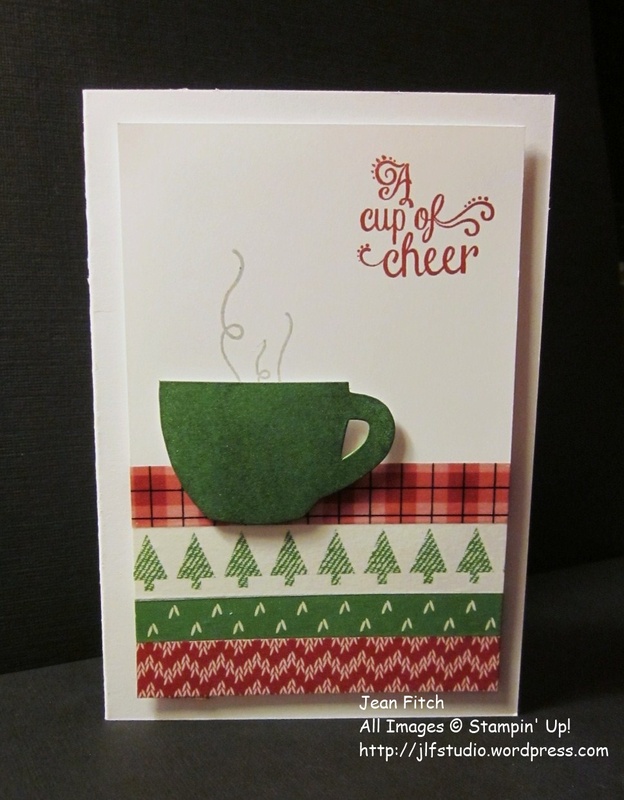 Attach die cut bow with a glue dot. If you want you can embellish the bow with a small punched or die cut glimmer paper star or rhinestones. 5) Carefully line up the J, O, Y from the Labeler Alphabet on a very small block and then carefully stamp on the white area inside of the wreath using Garden Green ink. 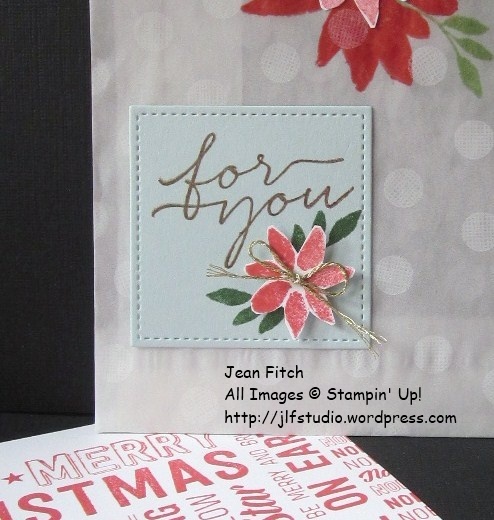 If you don’t trust your stamping you can stamp on a scrap and then cut out and glue down the individual letters. Also…if you make a boo boo when inking directly you can place a white circle of clean paper and try again or go with the cut outs. 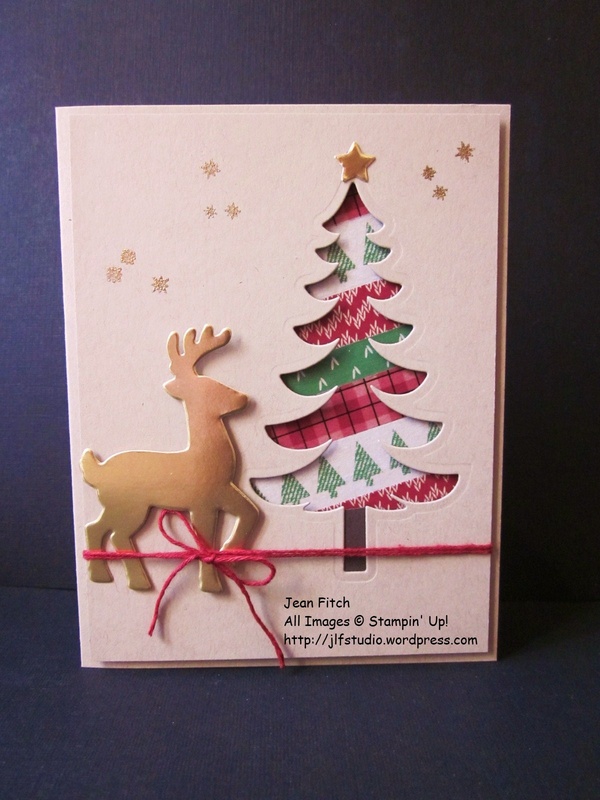 For the inside of my card I used a sentiment from Christmas Pines as well as the pine bough image. 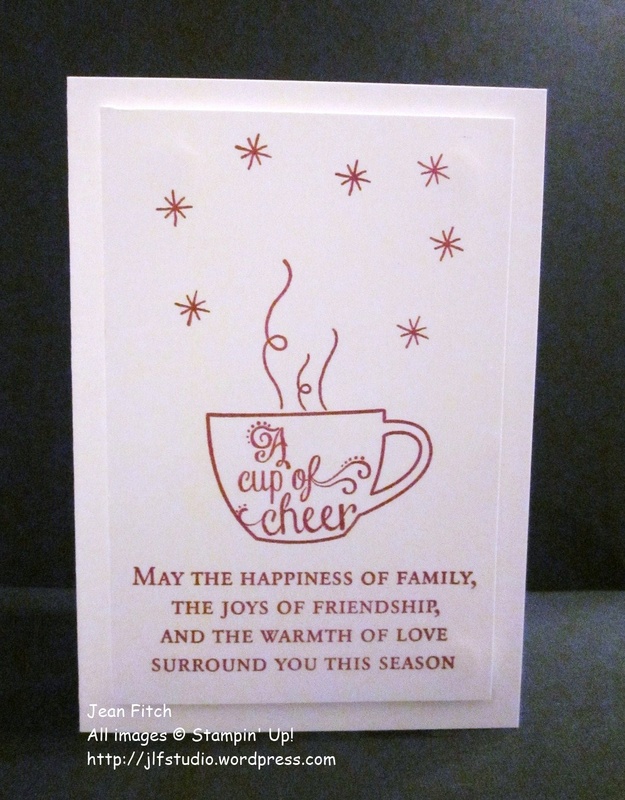 I also cut a 4-1/4″ x 5-1/2″ piece of the Warmth & Cheer DSP to cover my inking boo boos then added a die cut of the word JOY from the same die set that was cut from gold foil paper. 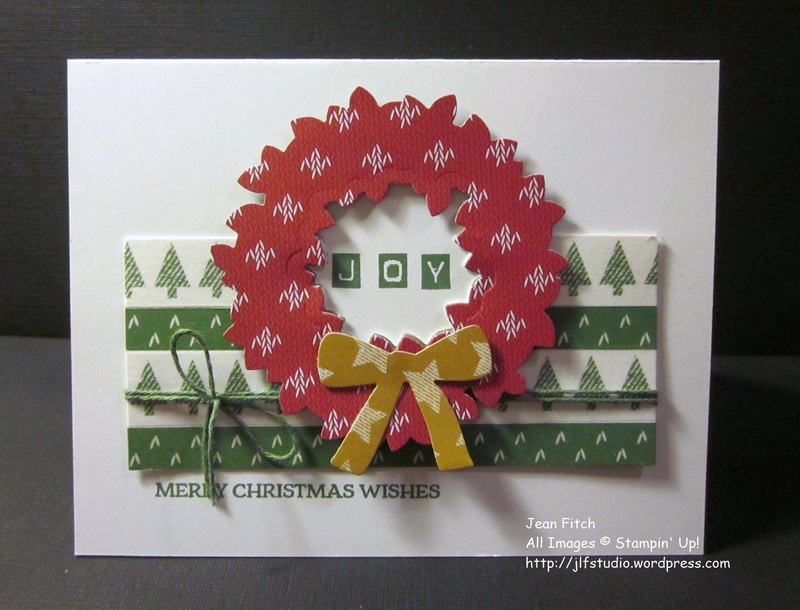 I applied the Joy die cut with rolled up glue dots. I removed the glue dots with a finger nail and then rolled the dots up into narrow enough pieces to place behind several sections of the die cut. You could also use the Fine Tip Glue Pen or Tombow Liquid Glue placed in small dots. That’s it for this challenge. 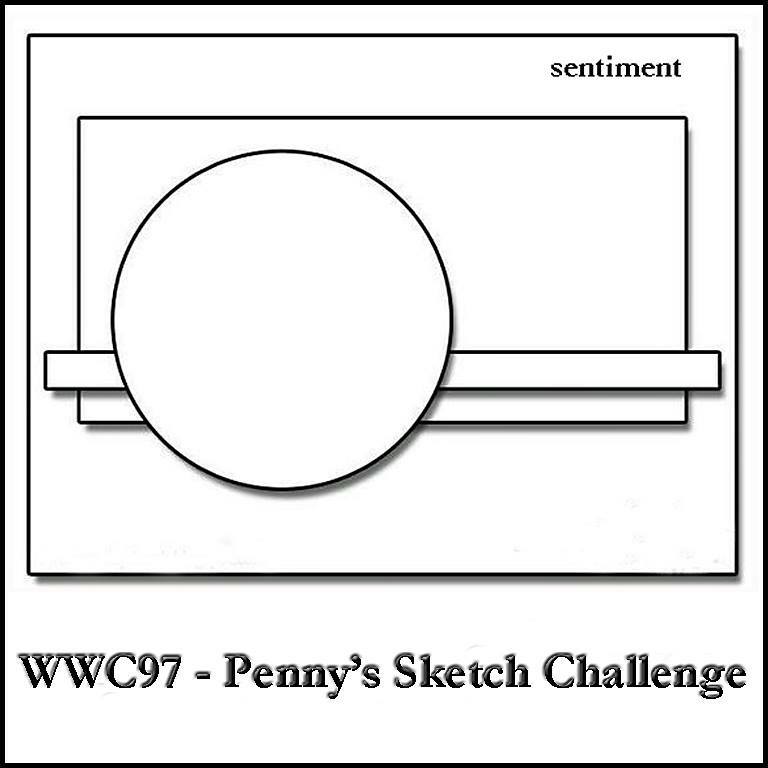 To see the rest of the design teams contributions to Penny’s Sketch Challenge head on over to the Challenge blog website here. That’s also where you can add your own creation with the linky doodad. 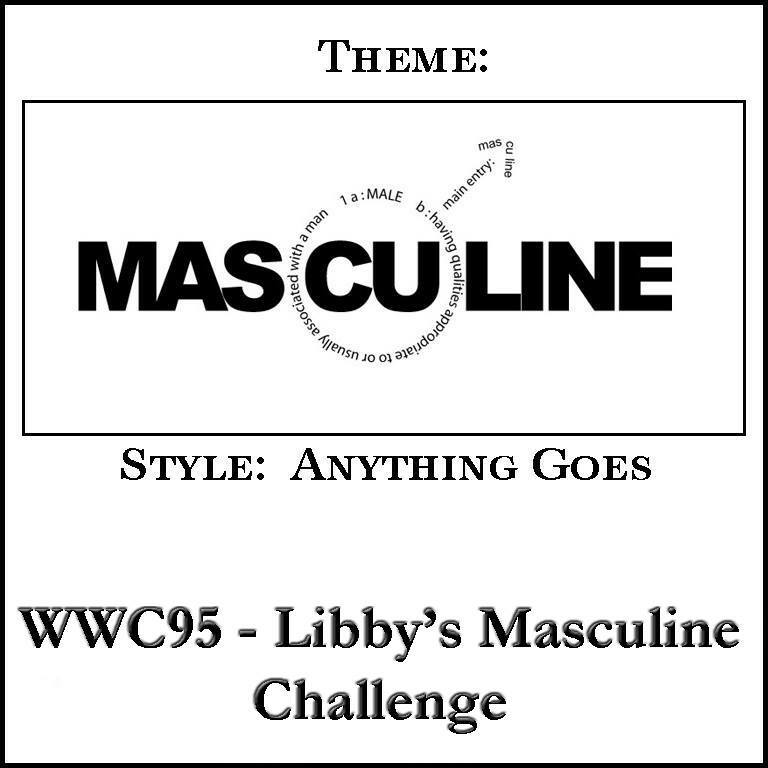 When you add your own design and there are more than three entries, one of you will be a challenge winner or runner up and have the option to place our badges on your own site. Of course…you’ll also win bragging rights! Wacky Watercooler November 2016 Blog Hop: All About Christmas! Hello and Welcome to the “All Out” Christmas Celebration Wacky Watercooler Blog Hop. If you are looking for inspiration for Christmas you’ve come to the right place. As usual you can follow this hop in a circle going either direction. Of course you can also return to the home hop site if you ever get lost along the way. That site will also, with a bit of scrolling back lead you to any and all of our past hops that you might still find inspiring. Now that you’re here I hope you’ve arrived from Gail’s blog. Gail is a dear friend I first met in the Watercooler. She’s also one of our many (and talented) Canadian stampers. I hope you found her projects as inspiring as I always do. I always enjoy Gails original take on life and on stamping. She’s so often the heart of our Watercooler stamping group. A fun presence that reminds us all how much joy there is in life. The secret ingredient is Washi Tape…and gold. Love that rustic/formal combo. Over the weekend I’ll be sharing a page of directions as well as a pictorial tutorial to show you exactly how it’s done. It’s really quite easy. 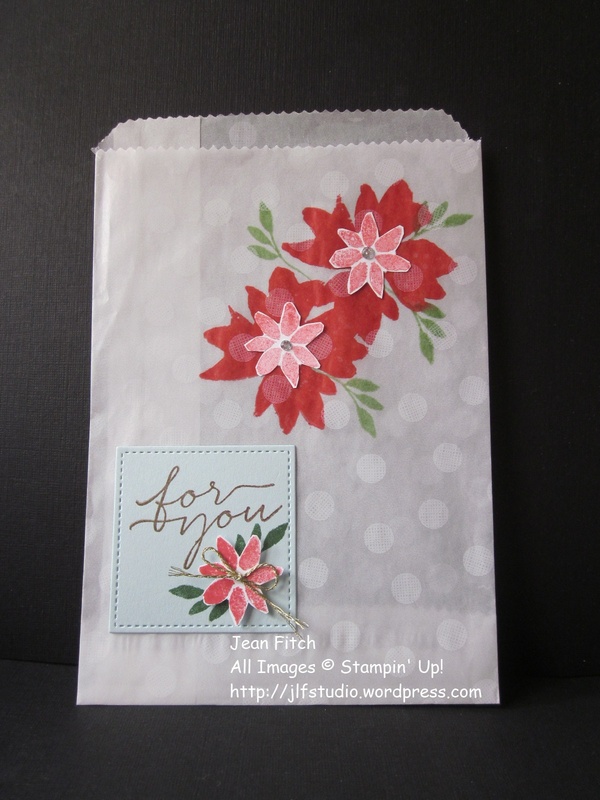 Next up is a fun Gift Card Holder in a bag. For this project I got my new Stitched Frame Framelits out to play. I’ve done the new rectangle from a square in this same design but wouldn’t you know…I gave that version away! Arghhh…just before the hop. So…check back again and I’ll have that for you too as well as directions on how to make the rectangle. In the meantime…here’s the simpler version. Note: The Blooms & Wishes stamp set that I used is 25% off through the end of November so if you want to CASE it’s the perfect time to purchase the ingredients. Other: Bone Folder, Linen Thread, Baker’s Twine Trio (Holiday Catalog), Rhinestone Jewels, Paper Snips, SNAIL, Glue Dots, Dimensionals. I’ll have directions for this one as well over the weekend. Last but not least here’s my final project. It just isn’t Christmas without a star right? 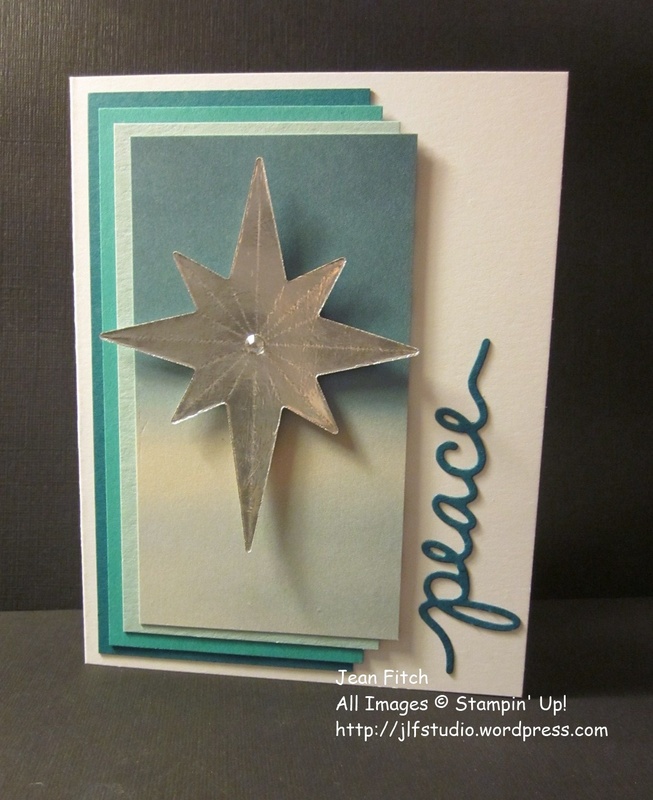 So using the Star of Light stamps and dies I’ve created a couple of “Star of Bethlehem” type card designs. Other: Big Shot, Evening Star Thinlits, Bone Folder, Silver Metallic Thread, White Seam Binding, SNAIL, Glue Dots, Dimensionals. I encourage you to play with the products that I’ve showcased today. Especially if you are still working on getting your own cards ready to send out. 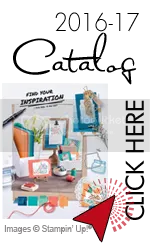 As you can see, the products I’ve used will coordinate with products you may already have or can find in the Stampin’ Up Holiday and Annual Catalogs. That’s it for my share of the hop. Time to move on over to my friend Christine’s blog. Christine is another original who is crafty in so many ways and areas and that joy of creativity always shines through. I know you’ll be inspired in so many ways. Enjoy the rest of the hop and I hope to see you back here soon. 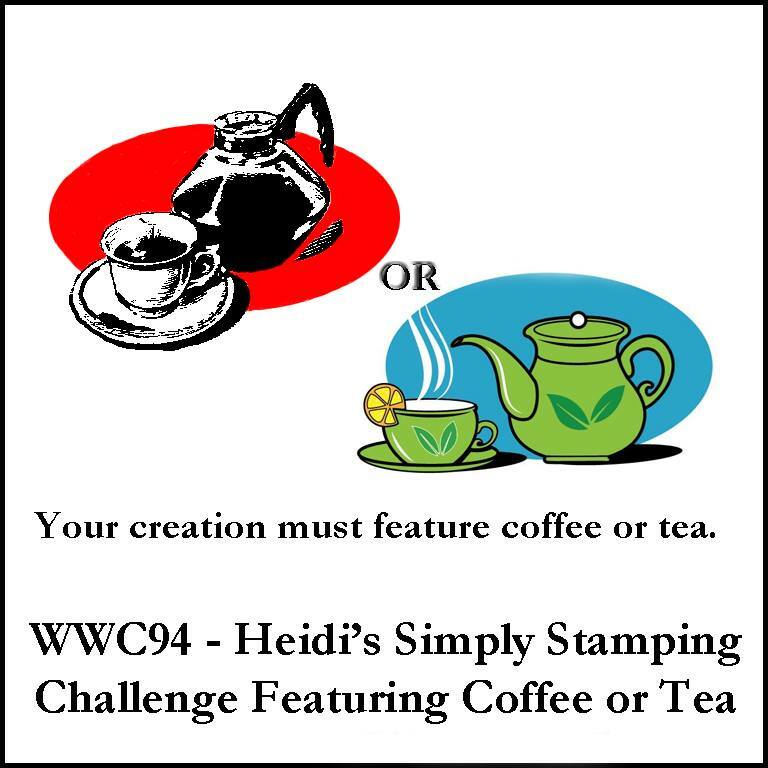 Watercooler Wednesday Challenge – WWC93 – Noel Bells or should that be Noel’s Bells? Deb has given us a cool set of colors to work with this week. I have to admit I had a hard time moving past those very cool and modern splotches and it took some time for my mind to wrap itself around a project idea. In part because of the colors and the splotches I kept thinking retro of some kind and masculine. Christmas never entered my head until I started seeing some of the rest of the teams ideas. Then I hit my head and said…of course…red and green and a couple of neutrals. Totally traditional and perfect for Christmas. Of course by that time I was down the modern rabbit hole so…ta..da..here’s my mix of retro modern with a hint of traditional for a Christmas card perfect for a guy. I really wish you could see this card in real life. Or that my photography set up was better. The dark vividness of the Real Red against the black mat and the stark white of the cardbase is really something. 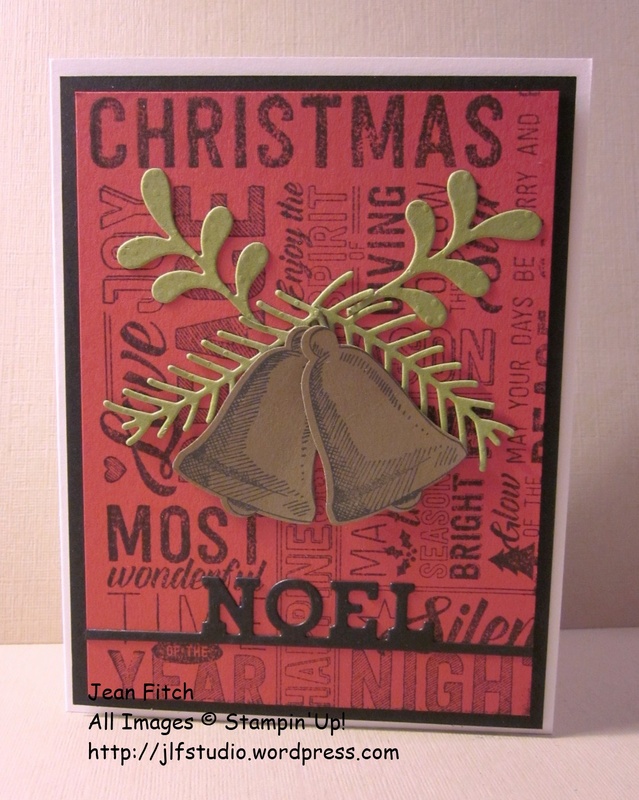 Then add the pop of green from the Old Olive and until you get to the Soft Suede bells this card has color that pops. It was quite a fun project. I found myself thinking modern graphic arts mixed with California Mission styles. Quite a combo. I’d love to know what you think. 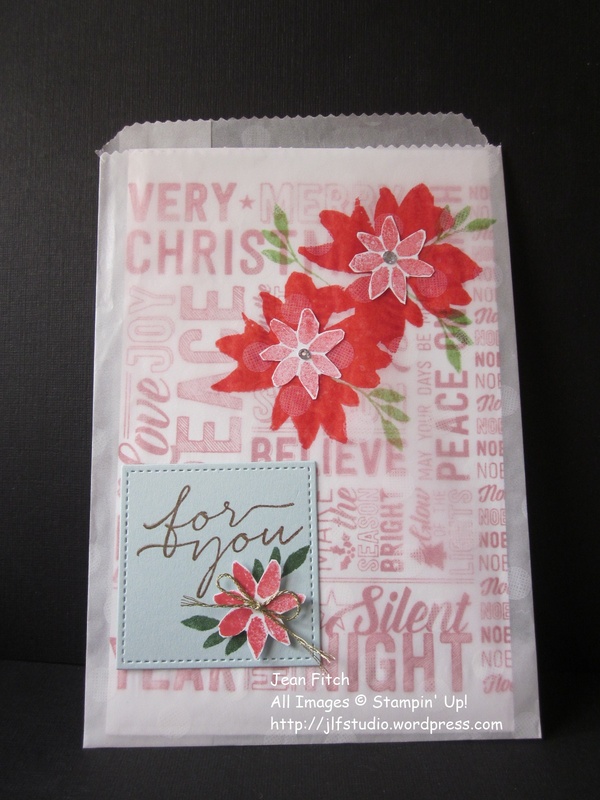 Tools & Adhesives: Big Shot, Pretty Pines Thinlit Dies, Christmas Stockings Thinlit Dies, Simply Score Tool, Bone Folder, Tombow Liquid Glue, Dimensionals, Glue Dots & SNAIL. Tip: When inking the Merry Medley background stamp place the stamp on it’s block face up on the table and ink by dabbing the pad onto the stamp. This lets you see where you might need extra ink for a well inked image. Tip: If you would like a wonderful set of greetings (about 14 I think) you can cut the background stamp into the individual sentiments that make up the whole stamp. Of course if you want the whole stamp back together again just keep track of a picture of the whole stamp to serve as a map for the complete block. 1) Place your background stamp face up on the table and ink with Memento Tuxedo Black or Basic Black Archival ink. Decide where you want the placement of the Real Red Layer to best feature the sentiments you want to see. Adhere the red layer to the Basic Black mat layer. 2) Die cut the boughs and mistletoe from the Pretty Pines dies with Old Olive scraps of paper. 3) Stamp and punch two bells using your favorite bell image (I like the one that resembles mission bells) and Soft Suede ink on Soft Suede paper. 4) Assemble your boughs and bells and adhere to the focal layer. I glued the greenery directly to the paper using small dots of Tombow Liquid Glue. I let the glue set up a bit before attaching to the paper. Attach one bell with glue dots and the second with a couple of Dimensionals for varying height. If you want you can pierce the tops of the bells and thread some Linen thread or a very thin ribbon through and tie a bow or knot. My linen thread has gone walk about so I skipped that step. I was afraid thin black baker’s twine would look too funereal. 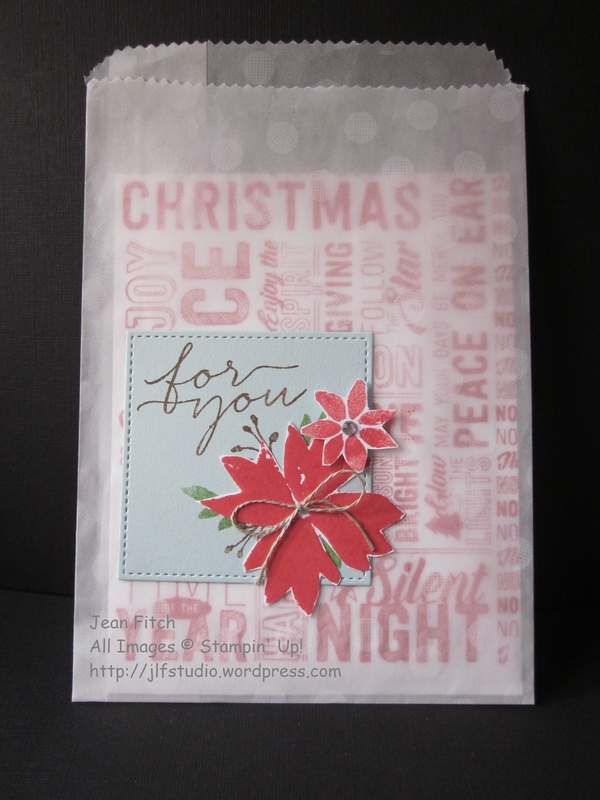 5) Add your focal piece to the white card base with dimensionals and voila! You’re ready to decorate the interior and envelope and then mail! Want to join in the challenge but can’t quite think what to do? Check out page 30 of the Holiday Catalog and find the Merry Medley sample at the bottom of the page. It’s perfect. Just swap out the black sentiment for a Soft Suede one and you are all set. That’s it for this challenge. 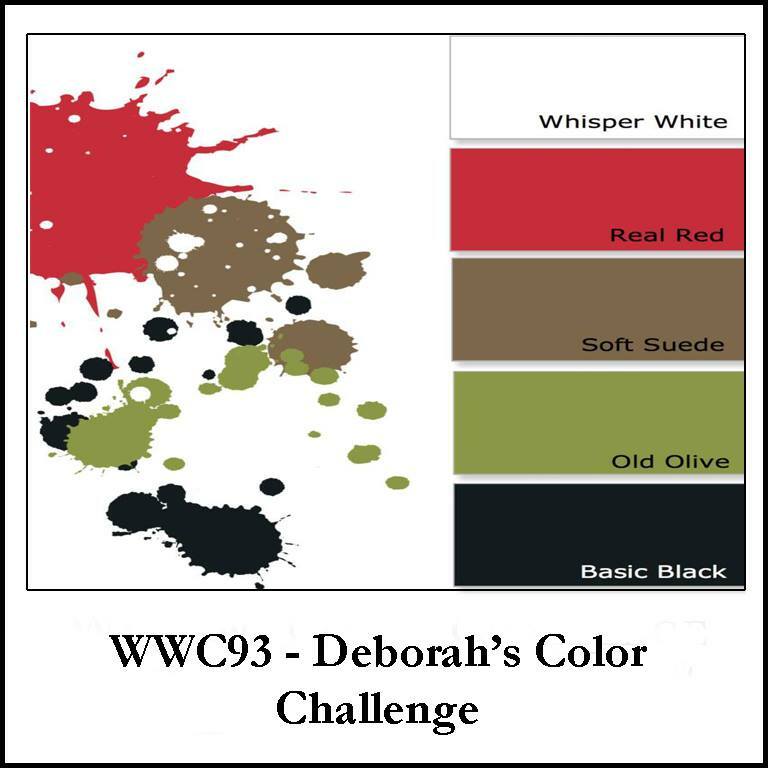 To see the rest of the design teams contributions to Deb’s Color Challenge head on over to the Challenge blog website here. That’s also where you can add your own creation with the linky doodad. When you add your own design and there are more than three entries, one of you will be a challenge winner or runner up and have the option to place our badges on your own site. Of course…you’ll also win bragging rights! 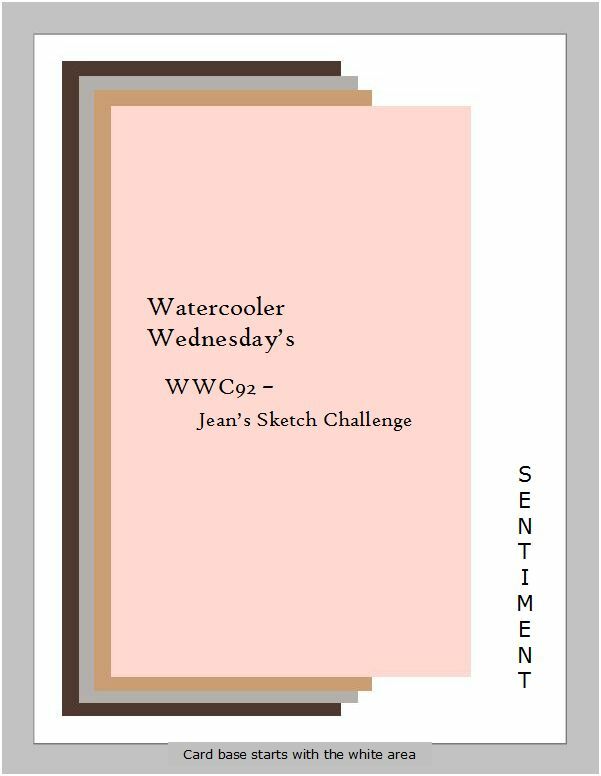 Welcome to this weeks Watercooler Wednesday Challenge. I had fun coming up with the sketch for this weeks challenge. Hopefully you’ll see from the Design Teams projects that you don’t have to follow the colors in the sketch. I used the color solely to differentiate the separate layers. Something else you might try. You aren’t limited to rectangle shapes of paper. If you want, your layers could be die cuts or other shapes. It’s the layering that’s important. Size is also totally up to you. After I had my card finished I realized I could have used a set of stars for my overlapping layers. That would have been cool don’t you think? Hm…something to try another time just to see if it works. I did try the Lots of Labels and Banner die cut shapes but they just didn’t seem to work for me. I hope some of you out there will let your imaginations take flight and see what you can come up with for this week’s sketch challenge. Once I knew what the basic theme I wanted was, it all fell together pretty quickly. I chose to apply a bit of the ombre technique, with gradations or shades of a color tone for my layering. I drew the colors from the piece of Serene Scenery paper that I knew I wanted to use and that would also complement the die cut silver star that was already sitting on my desk from a class I taught several weeks ago. Having a starting point always helps don’t you think? I also went with one of the layer colors for the sentiment die cut. One of the things I love about the star is the almost crackle feel it has to it’s look. At least in person anyway. I discovered that look when I experimented with which side of the foil paper I placed the Starlight embossing die when cutting. To get this look I placed the die on the white backside of the foil paper. You end up with a more subtle embossing and because the cutting plates I use are very chewed up some of that transferred to the foil as well. It also took down the perfect shiny mirror look of the silver foil too. So what do you think. Does this card have a bit of a beach feel to it or a star at early evening? Perhaps I’m being swayed by the Island, Bay & Pool in the color names? Or thinking Hawaii when choosing the papers? 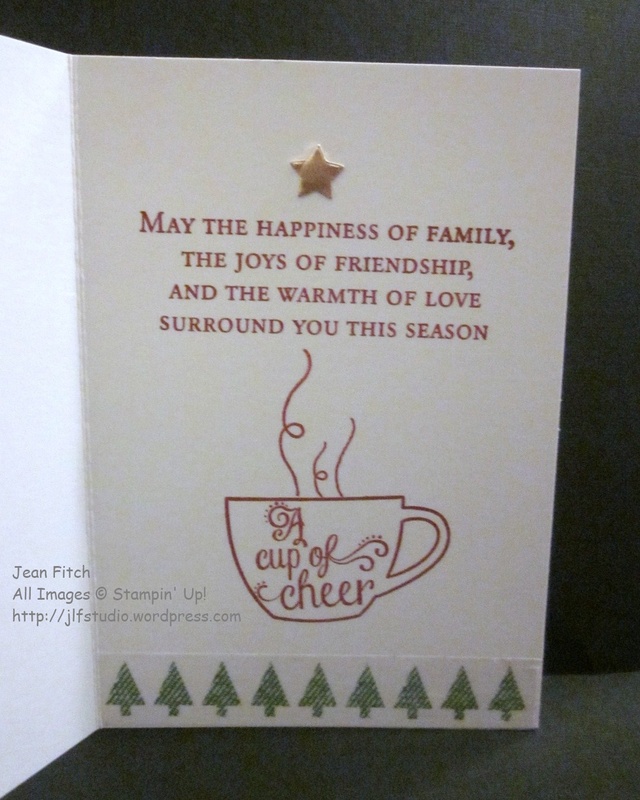 However you view it…may you experience the peaceful feeling in your own lives that I intended in this cards creation. Here are the details in case you want to recreate your own version. Tools & Adhesives: Big Shot, Starlight Thinlit Dies, Christmas Greetings Thinlit Dies, Basic Jewel Rhinestones, Simply Score Tool, Bone Folder, Dimensionals, SNAIL or Fast Fuse. Cardbase: Thick Whisper White – 5-1/2″ x 8-1/2″ Score at 4-1/4″ Fold and crease with a bone folder. Layers: Island Indigo 2-1/2″ x 5-1/4″, Bermuda Bay 2-1/2″ x 5″, Pool Party 2-1/2″ x 4-3/4″, Serene Scenery DSP 2-1/2″ 4-1/2″ Basically all the color layers are 2-1/2″ wide and the height decreases by a 1/4″ with each layer. 1) Cut layers as indicated above. Adhere them one by one offsetting equally as you move to the right. 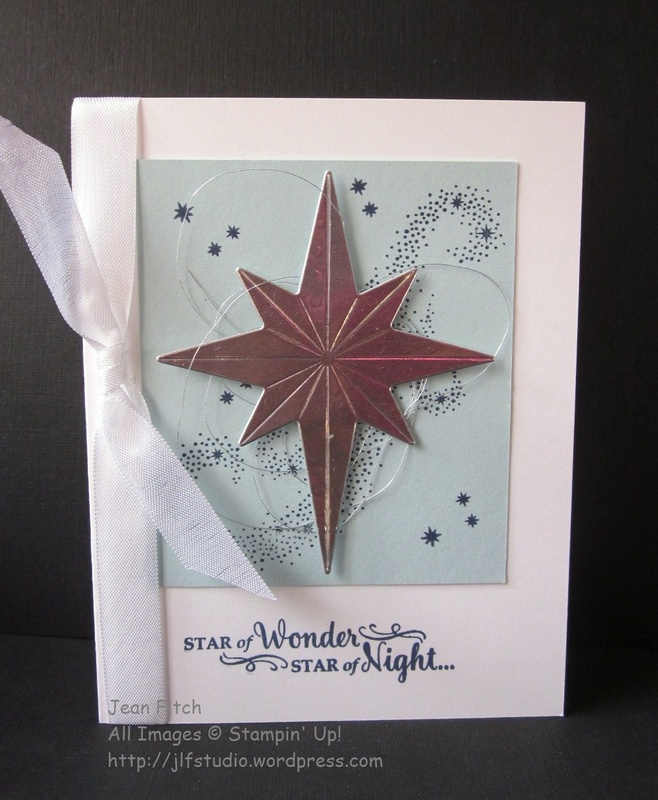 2) Die cut a large star from the Starlight Thinlit Collection. I used the one that embosses lines…but…I placed the die on the back of the foil paper (white side up) instead of the silver facing up. This gave a more cracked glass look to it. A tad more subtle. Adhere to the Serene Scenery Designer Series Paper Layer with Dimensionals. Add a rhinestone to the center. 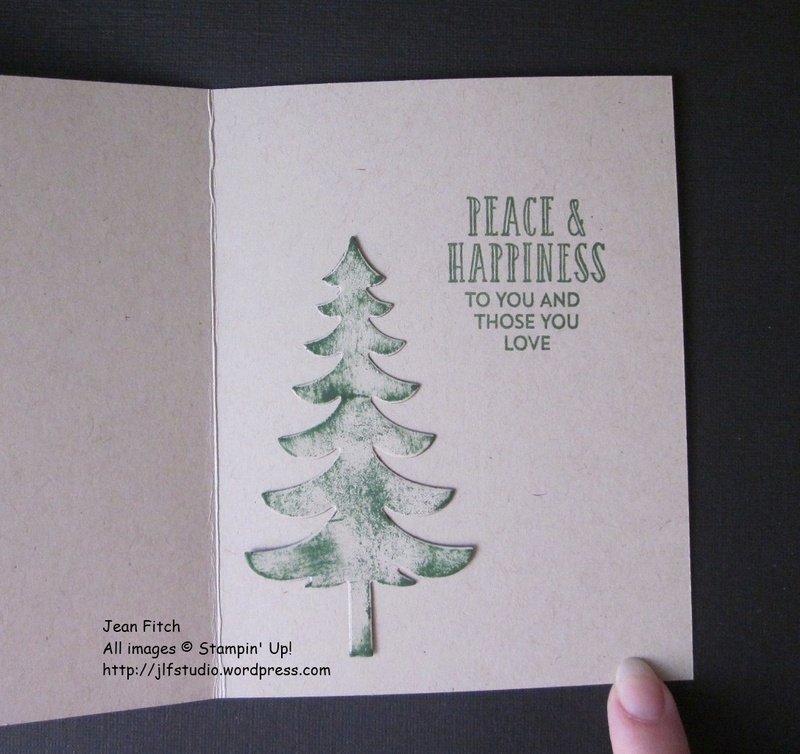 3) Using Island Indigo Cardstock die cut the word Peace using the Christmas Greetings die set. Of course any world would work if you want this to have a different flavor. Adhere the word to the right hand edge of the card. That finishes the exterior. 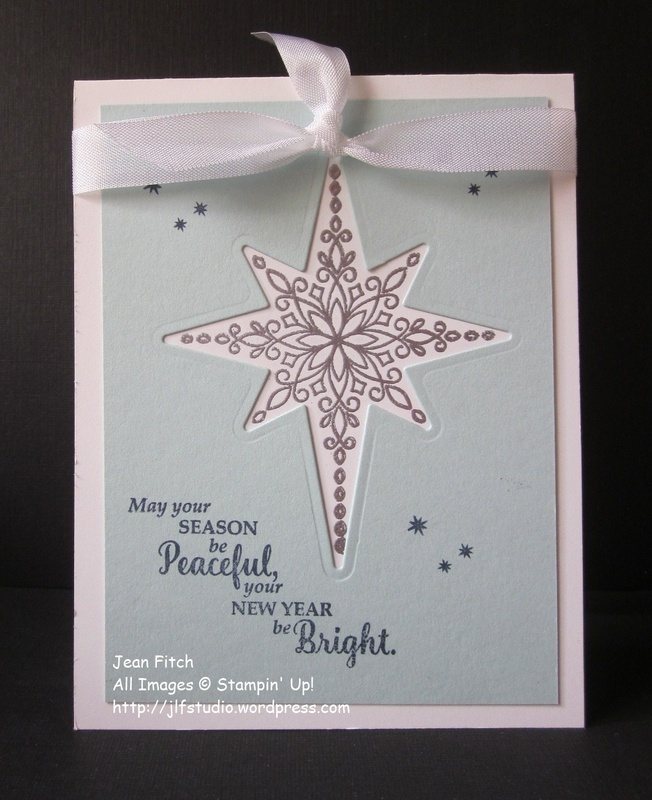 Optional ideas: Stamp some small star images from the matching Star of Light stamp set (perhaps heat embossing them in silver) across the Serene Scenery piece or along the visible white edges. Or scatter a few more small rhinestones around the card face. To finish the inside I adhered a small leftover strip of the Serene Scenery paper along the spine and stamped one of my favorite greetings from this year’s Annual Catalog Christmas section. That’s it for this challenge. To see the rest of the design teams contributions to my sketch challenge head on over to the Challenge blog website here. That’s also where you can add your own creation with the linky doodad. When you add your own design and there are more than three entries, one of you will be a challenge winner or runner up and have the option to place our badges on your own site. Of course…you’ll also win bragging rights! I hope you will add your own creations this week to the linky. I love the inspiration I find in your shared creations and would love to see what you make of my sketch.